So here we sit at the end of 2011, wondering where the hell it went, the time flew by, the months were too short and the endless skies sadly proved to have an end after all. We saw some months that moved us to tears and some months that saw us laughing like drains, we rode bikes and met people and we started new businesses. 2011, what a ride. We started the year with a spot of Urbexing up in Barrow hospital, nothing like a bit of poking around in abandoned mental hospitals, it was kind of creepy but sadly it was not something that we repeated. We did have our eyes on an old hotel, but sadly it burned down before we could get inside. Cause of the fire was rumoured to be the people breaking in and vandalising the place. All that is left is a broken shell and maybe a vague hope that there is still something worth seeing. February saw us arsing about in the garage, making Rosie run and putting a new engine into Agnes after blowing the old lump on the ride to work. Yet with a new 550 lump sat in place, she still refused to run right and it took a new set of carbs, a new loom and more work to complete to get that bike working right. I was also taking my first pillion for a ride since passing my test, a ride that inspired her to go further and further. Then Jack fluttered into our lives, a darling little Starling, fresh from the nest and clamped in the jaws of a local cat. After a swift chase, the little baby bird was rescued and taken home to the Shrubbery, to be put in a box and left in the dark. Putting baby birds in the dark reduces the stress they are under, but cat bites are serious, cats are filthy animals and bites to wild birds will lead to septicemia in the little bird. If Jack could make it through the night, he stood a good chance! Two days later, Jack died of septicaemia and both Carol and I were deeply upset. Jack had been sitting on our fingers and taking food, we truly thought that he was going to make it. Buried in the garden, Jack was gone from our lives, but not our hearts. That night Carol made a discovery. Alby was in our hands and hearts with in twenty four hours. 2011 was also the year that Carol lost her Nan Noreen. Always a gentle woman, she passed away in hospital, taking with her a past that we will always wonder about. In memory of her came Noreen the ZRX1100, Carol’s new bike and a lovely trip from Brighton to bring her home. 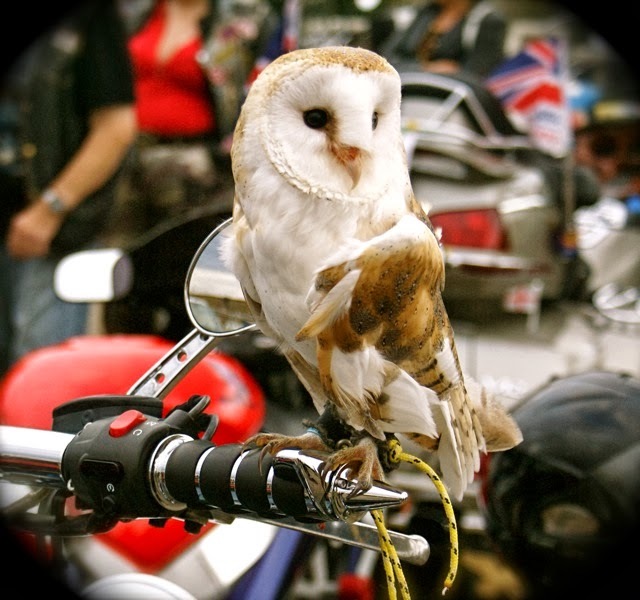 We spent the summer supporting Weston Super Mare Bike Night, an event that raised over £12000 for the Royal British Legion. How did we support this event? Well by using our new company, Biker Rock Radio, a subsidiary of the STF group. We provided the PA and music for each event that we could and had a great time every night, even when it poured with rain. If you ever want some where good to go on a Thursday night, then Bike Night it is! A trip to London for the wedding was a lovely trip and riding both bikes was a dream come true, the wedding of Rachel to Jan was lovely, but leaving the bikes locked out side while the first night of the London riots took place was an experience. The ride home was equally fun, but as with any ride, the return home is always bitter sweet. 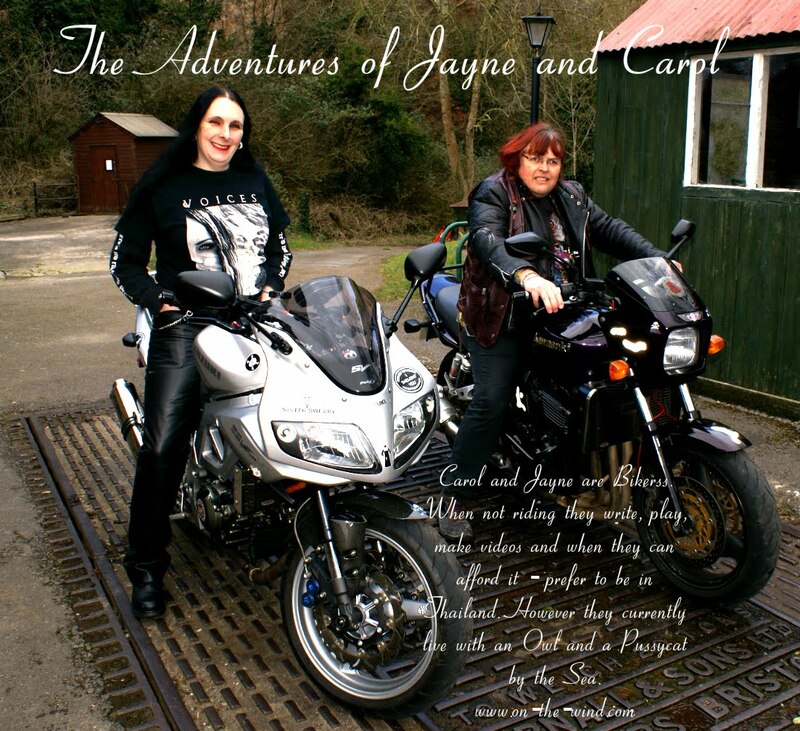 Our big adventure in 2011 was the Bulldog Bash, a first for Jayne, but another badge for Carol to put with the rest in her collection. The ride over to the venue was a fully loaded festival of riding. I started off with the phones in and music blasting, riding along listening to Slayer is always a treat. For me the best part of the Bulldog was the Drag strip, watching those bikes blast down that strip filled me with an excitement and a desire to do the same one day. Once back home Sylvie had a small accident, when a work colleague of Jayne’s reversed her car into her. The damage was not excessive, but it was enough to render Sylvie unridable. As soon as it was reported to the insurance, a hire bike was delivered, but given that it was a sports bike, Jayne could barely ride it. She then spent five months riding the most boring bike ever built, the Honda CB600F, the motorcycling equivalent of crocheting bobbles hats! With the final Bike Night upon us and a dark winter to look forwards to, our dear friend Wayne has just finished his Superb Kawasaki ZX10R stealth fighter. It was the bike equivalent of a super model, thin, pretty but with the engineering excellence of a mad genius under every panel. Sadly while on his way to the last Bike Night of the year, Wayne was very badly hurt in an accident and the ZX10R was left a barely rolling wreck. With Wayne in hospital, Biker Rock Radio DJs Carol, Lee and Jayne drove out to collect it from the depot. With it safely put in the trailer, it was delivered to Wayne’s Dad and left in the garage. Fortunately Wayne is now out of Hospital, but for a while he was a great worry to us. Thankfully, the ZX10R is also back in the workshop and Dr Wayne is about to start a rebuild. Carol and Jayne were both asked to take part in the Remembrance Parade as members of the British Legion. With Carol on the ZRX1100 and Jayne still riding the Hire Honda, we took part in the parade along with other members of the local Riders Branch. It was a proud moment for us both being there with the other riders and veterans. Finally Sylvie came home and the horrible Honda was sent back with a flea in its ear. Riding Sylvie again was a joy after the boring Honda, the feel of the power, the way she drops into corners and just the grin factor of riding a bike that growls in the way that she does. She was in need of a Valve check though and Jayne was dreading this. If she needed new shims it was a case of removing the cams. Luckily everything was with in tolerance and no cams needed pulling out. So that was out 2011, a mixture of the sad and the exciting, great times spent with friends at their best and worrying time spent with very ill friends and loved ones. We had some great adventures and saw some amazing things. With 2012, we have Carol’s son Alex about to take the big step into the world of motorcycles as soon as he is old enough to get his license. We have Bike Night starting again in April and there are the other many things that we are looking forwards to as well. So from all of us at Curious Adventures, we hope that your 2012 will be fun, peaceful and most of all, filled with curious adventures.